So many people suffer from mental health these days, and it is even trickier than other physical issues because they are so hard to detect. A person may still feel "all right" before he/she suddenly got overwhelmed by a wave of negative feelings. We want to help. In this era of big data, we want to use methods of technology to help people better monitor their mental status. You simply put into your daily diary and we will help you analyze the underlying sentiments. 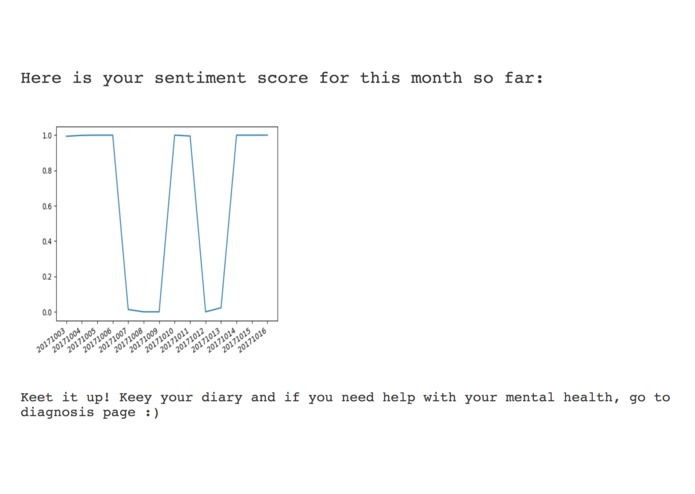 Using Microsoft Text Analysis API, we generate a sentiment score ranging from 1 to 100, the higher the more positive your mood is, based on the keywords of your diary. We also provide a data visualization page where you can see your sentiment score for the past month. 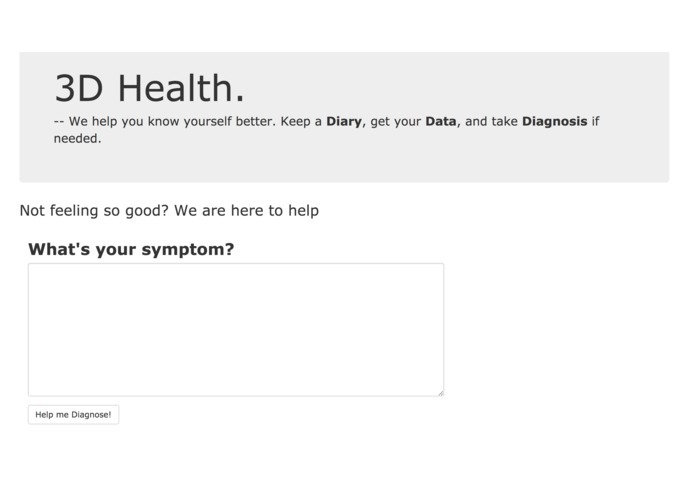 If your sentiment scores have been low for quite a time period, we will direct you to a diagnosis page where you can input certain symptoms you feel that you are suffering, and we will tell you what specific illness that may be. We also provide a list of links which offer support from chat room to relaxing games, aiming to provide you with some help even if we do not personally see or know you. Mental health issues and stressed out life could be tricky. 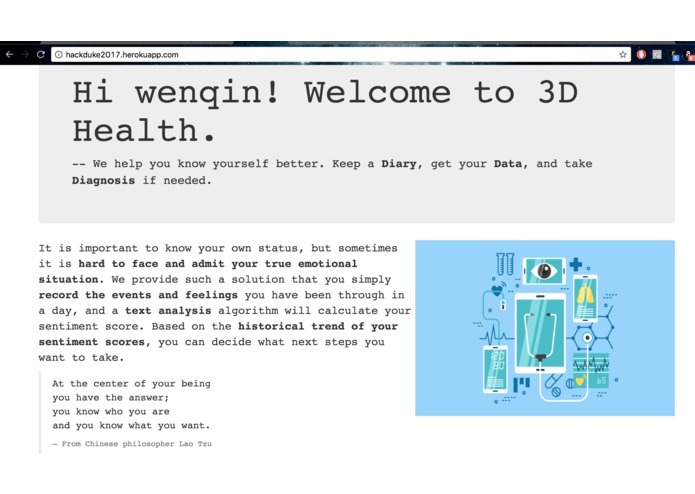 But we believe that with the power of technology, we can offer you a 3-D perspective of your health and help you find a way out together. 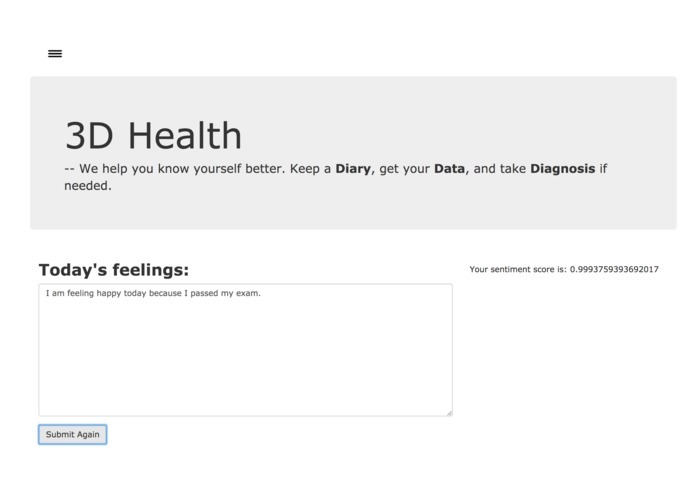 What we try to provide is a very intimate space for users to focus on themselves and their mental health data. 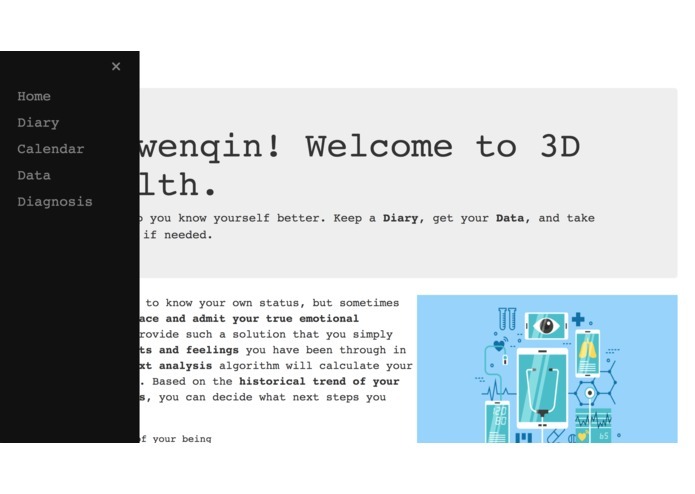 Without distractions and social pressure, the format of diary keeping invites the user to truly reveal their status and feelings. Meanwhile, the analysis we provide is very straightforward: a score per day. 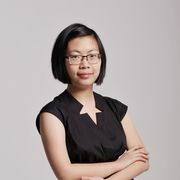 Users can easily monitor their change in feelings and see a very direct display, which also prevents them from feeling intimidated by the idea of "analysis." We hope to include more symptoms and have more detailed data analysis, with more powerful text analysis and more in-depth visualization.